**Update** I have been working on a new blog for a while now and decided to open it up for people to look at. It is in honor of Emma and it is called Butterfly Kisses. www.rememberingemma.blogspot.com Please check it out and help me remember her. Today Anna Grace turned five months old. Five months without a mommy and a daddy and a big sister. Five months living in an orphanage. Five months. I was going to post a blurb about what a five month old should be doing now but I just can't even make myself look in "the book" to see what she might be doing. I just want her here. I want to see for myself, not in a book. Anna Grace, I pray that you are safe and healthy. I pray that you have someone to hold you close and love you. I pray that you are a happy baby. I pray that you are held in the arms of Jesus. 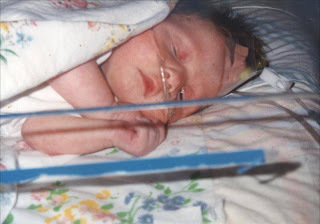 I remember when Emma was born and she spent such a long time in the NICU and we had to leave her there each night. I had such a hard time leaving her but I would mentally picture myself placing her in the arms of Jesus to rest. I find myself doing the same thing with Anna Grace. I cannot be there to hold her but there is someone who is always there. I got a call yesterday from a very good friend. 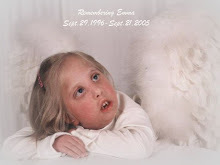 My friend, Brenda, had a daughter with the same condition as Emma. Hailey passed away almost nine years ago. She was seven years old. Brenda was my mentor in the early days with Emma. She had already been walking this path for four years when Emma was born. Brenda would listen to me, counsel me, and coach me through the rough times. I remember the first time I met her, I was so full of apprehension. I wanted to meet her yet I really did not. Emma was still a baby and I knew seeing Hailey would be hard because it would make everything seem more real. I would see my own future when I saw Brenda. I did meet her and it was emotional, but it was good. Three years later, Hailey passed away and once again I knew I would be facing my own future when I walked into that funeral home. I wanted to go for Brenda but I was so scared to face that reality of death. I did go and it was hard, but I was glad I went. Six years later, it was Emma's turn to go to Heaven and Brenda called to tell me that she was out of the state and couldn't be at the funeral. Imagine my surprise when I saw her walk through the doors of the funeral home. She had come home early to be there. I remember just holding each other for the longest time. 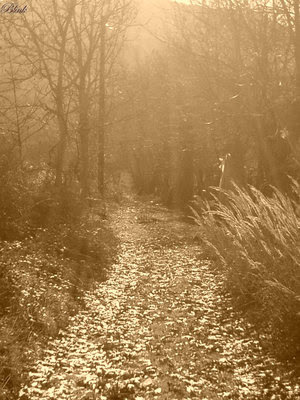 She had always walked the path ahead of me and seeing her was such a healing balm to my soul. To see someone who truly understood was a gift that night. And talking to her yesterday was just what I needed. There is something about talking to someone who knows your pain, who shares your story, who won't minimize your hurt because it makes them uncomfortable. Talking to Brenda reminded me for just a while of who I am and who I was and who I want to become. Thank you, Brenda. I love you. One of the things we talked about was the overwhelming feeling that our girls are still with us. At times when we need to have them closer, it seems God provides us with visual and spiritual reminders that they are fully alive in Him, and it comforts us and gives us the motivation to keep walking the path before us. Even though it is hard and it feels like we are all alone, it is our path to walk and the destination is worth the journey. Hey Stacey, my email is running again. You must be getting excited! I hope you hear the good news soon.